Over the last months the Euro has drifted from about 1.45 USD to below 1.30 and some commentators see this as the sign of the decline of the Euro, driven by all the economic problems of European countries. It is not uncommon to read about the "weak" value of the Euro today. Before referring to a currency as "weak" it is always good to check whether the Euro is today undervalued by comparing it to its history. Unfortunately the history of the Euro is short (post 1999) so what I have done below is to simulate the US dollar / Euro exchange rate starting in January 1975, where the German Mark has been used as a reference for the Euro prior to January 1999 (the German Mark has been "converted" to Euros so that the scale can be read as US dollars per Euro). I will refer to the Euro during the pre-1999 period even if we are really talking about the strength of the German Mark, relative to the US dollar. The Euro has fluctuated from a high value of 1.59 in July 2008 to a low value of 0.59 in February 1995. Are these numbers comparable? Not quite. Currencies are expressed in nominal terms so they are likely to move over time when inflation rates are not the same in both countries. In this particular case, we have witnessed an upward drift of the Euro over the years because inflation was on average lower in Europe. This trend can be captured by estimates of Purchasing Power Parity (PPP), in red in my chart. But even when we take into account this trend, the value of 0.59 in 1985 was a significant undervaluation of the Euro (the German Mark then) in comparison to PPP (around 0.95). 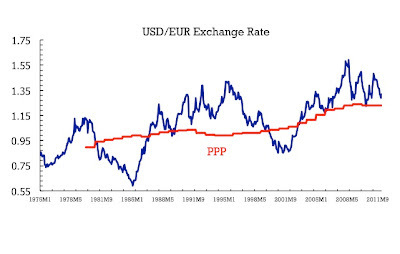 Same for July 2008, the value of almost 1.6 represented a large overvaluation of the Euro relative to its PPP value (below 1.2). We also see in the chart that episodes of overvaluation or undervaluation relative to PP are persistent. A strong Euro in the late 70s was followed by a very weak Euro during most of the 80s. 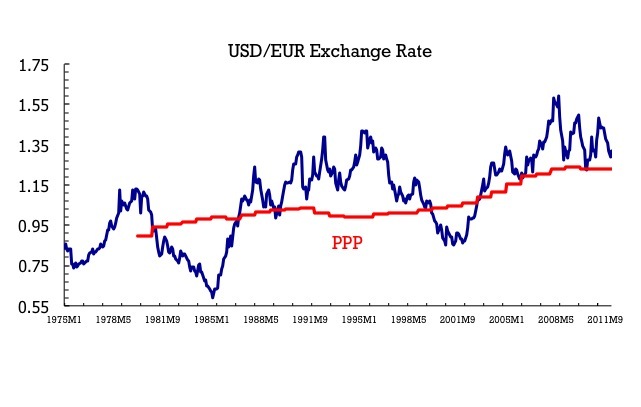 During the 90s the Euro was in general above PPP estimates. Before the official launch of the "real" Euro in 1999, the German Mark was already heading down and this trend continued leading to another episode of undervaluation of the Euro. An episode that was stopped by a join intervention of the US Fed and the ECB in November 2000. Since then the Euro became stronger and stronger until it reached its peak of 1.6 in July 2008. The financial crisis of the Fall 2008 and the flight to quality that it triggered raised the value of the US dollar (and made the Euro weaker). Since then we see two waves where the Euro picks up again but later loses all the gains. The value of the Euro today remains above the PPP estimate (so we can still call it "overvalued") and by historical standards, the value in Feb 2012 is very far what we could call a special year. The recent swings are also consistent and similar to movements we have seen before. So we do observe today a large amount of volatility in this exchange rate but something which is not really new for this market. And the current value of the Euro seems very reasonable when compared to some of those extreme episodes of over- or undervaluation that we have witnessed before.